Dr. Sarah Jung obtained her PhD in Educational Psychology in 2014. She is a Faculty Associate in Education Research and Development in the Department of Surgery at the University of Wisconsin-Madison. She is an expert in educational psychology with a focus in Learning Science, the study of how people learn in different contexts. She has studied the incorporation and impact of digital technology in the classroom. She is currently involved in multiple studies in the areas of undergraduate, graduate, and continuing surgical education. Her background allows her to apply theories of learning to understand how people become expert physicians and how we can support this process to facilitate quality patient care. 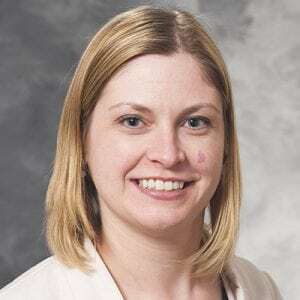 Her training in assessment as well as quantitative and qualitative research methods allows her to conduct and consult on a variety of research projects in surgical and medical education. Dr. Sullivan’s research interest and program focuses on how environments designed to complement the clinical learning experience facilitate knowledge and skill development. These environments include online learning systems, simulated environments, and virtual or augmented reality systems. In medical education, these environments often include information repositories, virtual patients, and mixed reality systems that attempt to create both environmental and haptic fidelity. The focus of her work is the study of the influence of individual learner factors on the cognitive processes involved in learning with these environments. She is also interested in the optimal combination of simulated environments and in-practice clinical experience to facilitate learning, as well as investigating how what is learned in these complementary learning environments transfers to performance in clinical practice. The surgical consult entrustable professional activity (EPA): Defining competence as a basis for evaluation. What do you want to know? Operative experience predicts the type of questions practicing surgeons ask during a CME laparoscopic hernia repair course.